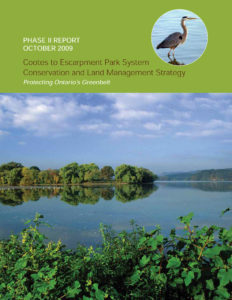 Orland Conservation was retained by the Royal Botanical Gardens in 2009 to act as Project Manager for the Cootes to Escarpment EcoPark System project. Led by the Royal Botanical Gardens in partnership with nine local stakeholder organizations, this exciting land conservation initiative represents a complex, multi-tier and multi-stakeholder conservation vision. Supported by generous funding from the Friends of the Greenbelt Foundation, the project lays out a 10-year vision for stewardship and expansion of the 3,700 acres of existing natural areas through the establishment of innovative joint management programs and working with the public to help maintain the areas’ richness. The project would see the creation of a regional urban eco park in Ontario’s Greenbelt, stretching from Hamilton Harbour and Cootes Paradise to a 10-kilometre section of the Niagara Escarpment. This area encompasses substantial portions of the Grindstone and Spencer Creek watersheds and is one of the most botanically rich places in Canada, with nearly a quarter of the country’s wild plants growing within its boundaries. The primary goal of the strategy is to create the park system through a holistic conservation approach by connecting and expanding existing greenspace. This will be achieved through securement of additional lands that provide linkages to existing protected natural areas, protection of natural features on complementary lands that link and support the ecological function of the park system, management planning and stewardship actions, and environmental restoration of degraded areas. Throughout 2009 and into 2010, Orland Conservation facilitated the public-consultation process by delivering community forums, partner meetings and public open houses. We kicked off the release of the final project report last February with a fun day of informative presentations and outdoor activities at the Royal Botanical Gardens’ Nature Interpretive Centre in Hamilton. Over 200 people including local landowners attended the event enjoying partner exhibits, children’s activities, Mountsberg Raptor Centre live bird of prey exhibit, ceremonial bonfire lighting and marshmallow roast, guided hikes by Iroquoia Bruce Trail Club and skating on Cootes Paradise Marsh.